Frost is getting to be a distant memory, but in northerly regions you have to be careful – it can still sneak up. Plant new trees and shrubs – mid-spring is a great time for new additions. Check these planting tips. Prune woody plants, including broad-leaved evergreen plants and evergreen or deciduous hedges. Mulch under shrubs to retain moisture and keep weeds down. 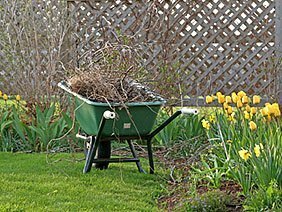 Spring-flowering shrubs should be pruned right after their blossoms fade. To encourage thick, compact growth on pines and other needled evergreens, pinch the new candles (a term for the new growth on evergreens) to remove half of the new growth. Check out this pruning guide. Water newly planted trees and shrubs, ground cover plants and perennials if there isn’t enough rain. See watering tips. Keep on top of the weeds. Weeds are growing most vigorously now. Getting them now means less weeding later on in the season – and you’ll prevent weeds from going to seed. Lawn care in mid-spring means keeping up with the mowing. Set your mower to a height of about three inches, and try not to remove more than one-third of the blades at one cutting. Aerate your lawn or have the job done by a lawn service. More tips on lawn care. Control lawn weeds and find out how to control dandelions effectively. Maintain your perennial garden by continuing to plant and transplant perennials. Divide perennials and ornamental grasses that need it. Plant container gardens – see planting tips for containers. Annuals and summer bulbs – plant frost-tender annuals and dahlias and other summer-flowering bulbs such as gladioli after the last frost date for your region. Label any new plants so you’ll remember what they are or draw a map of your garden. 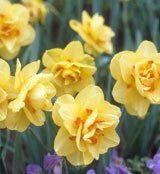 Note of any mid-spring garden gaps that could be filled with spring bulbs for next year and buy new plants to fill any holes now. Mulch your flowerbeds to encourage soil to stay moist and minimize weed germination. Check out mulching tips. Stake perennials such as delphiniums and peonies before they’ve grown too tall (bamboo sticks and string do a better job than most commercial supports). Water your garden if it doesn’t rain enough. Most plants need an inch of moisture per week. See these water-wise garden tips. Apply fertilizer. See organic fertilizer tips.